I don’t usually look ahead, but I peeked at what is coming up in the M’s and have to warn you that we will probably not be done with them until the end of January. Yes, I have over a month of M’s. Shall I give you a hint? Well, you already know about Paul McCartney and Lee Michaels, and some of the albums go as far back as to my infancy, so maybe we’ll wait until I can give you young ones more details. Back to the Mamas and the Papas. 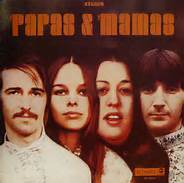 This album has an interactive cover that states it is a “Special Fun Jacket” and “Mamas & Papas Exchange Faces,” which is done by lifting the top or bottom portion of the cover photo of the four of them to mix with the photo underneath of them in a different order. It was fun back then. But what I best remember of the Mamas and the Papas is that they seemed to have fun while performing on the Ed Sullivan Show, which then seemed to please old Ed, and later the movie made from the Monterey Pop Festival that was organized by Papa John Phillips and others in less than two months time. The festival preceded Woodstock by two years, and a number of artists like Jefferson Airplane and Jimi Hendrix performed. There was also a performance by Big Brother and the Holding Company, and the movie focused on their lead singer Janis Joplin. There’s a shot in the movie that I remember clearly, of Cass Elliot sitting in the audience appearing awestruck at Janis. You can see Cass say “wow” at the end of one song. It was indeed a wow-worthy performance.